Neil Mitchell, Simon Peyton Jones and I have just finished a paper describing a systematic and executable framework for developing and comparing build systems. The paper and associated code are available here: https://github.com/snowleopard/build. The code is not yet well documented and polished, but I’ll bring it in a good shape in April. You can learn more about the motivation behind the project here. A Task is completely isolated from the world of compilers, file systems, dependency graphs, caches, and all other complexities of real build systems. It just computes the value of a key k, in a side-effect-free way, using a callback of type k → f v to find the values of its dependencies. One simple example of a callback is Haskell’s readFile function: as one can see from its type FilePath → IO String, given a key (a file path k = FilePath) it can find its value (the file contents of type v = String) by performing arbitrary IO effects (hence, f = IO). We require task descriptions to be polymorhic in f, so that we can reuse them in different computational contexts f without rewriting from scratch. We instantiate the type of keys k with String (cell names), and the type of values v with Integer (real spreadsheets contain a wider range of values, of course). The task description sprsh1 embodies all the formulae of the spreadsheet, but not the input values. Like every Task, sprsh1 is given a callback fetch and a key. It pattern-matches on the key to see if it has a task description (a formula) for it. If not, it returns Nothing, indicating that the key is an input. If there is a formula in the cell, it computes the value of the formula, using fetch to find the value of any keys on which it depends. Task Applicative: In sprsh1 we needed only Applicative operations, expressing the fact that the dependencies between cells can be determined statically; that is, by looking at the formulae, without “computing” them — we’ll demonstrate this later. Task Monad: some tasks cannot be expressed using only Applicative operations, since they inspect actual values and can take different computation paths with different dependencies. Dependencies of such tasks are dynamic, i.e. they cannot be determined statically. Task Functor is somewhat degenerate: the task description cannot even use the application operator <*>, which limits dependencies to a single linear chain. Functorial tasks are easy to build, and are somewhat reminiscent of tail recursion. Task Alternative, Task MonadPlus and their variants can be used for describing tasks with non-determinism. Now let’s look at some examples of what we can do with tasks. Here we do not need any effects in the fetch callback to task, so we can use the standard Haskell Identity monad (I first learned about this trivial monad from this blog post). The use of Identity just fixes the ‘impedance mismatch’ between the function store, which returns a pure value v, and the fetch argument of the task, which must return an f v for some f. To fix the mismatch, we wrap the result of store in the Identity monad: the function Identity . store has the type k → Identity v, and can now be passed to a task. The result comes as Maybe (Identity v), hence we now need to get rid of the Identity wrapper by applying runIdentity to the contents of Maybe. λ> compute sprsh1 store "A1"
λ> compute sprsh1 store "B1"
As expected, we get Nothing for an input key A1 and Just 30 for B1. Notice that, even though compute takes a Task Monad as its argument, its application to a Task Applicative typechecks just fine. It feels a bit like sub-typing, but is actually just ordinary higher-rank polymorphism. Now let’s look at a function that can only be applied to applicative tasks. Notice that these calls to dependencies do no actual computation. They cannot: we are not supplying any input values. So, through the wonders of polymorphism, we are able to extract the dependencies of the spreadsheet formula, and to do so efficiently, simply by running its code in a different Applicative! This is not new, for example see this paper, but it is cool. Note that B1 and B2 statically form a dependency cycle, but Excel (which uses dynamic dependencies) is perfectly happy. 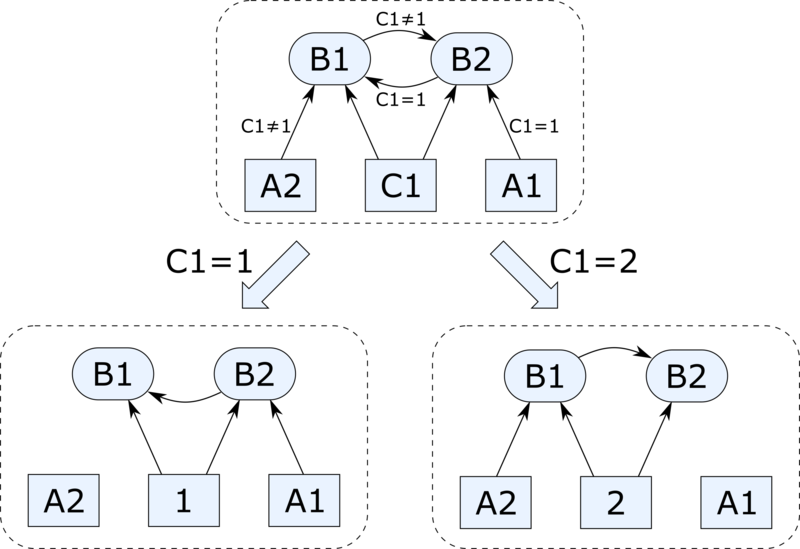 The diagram below illustrates how cyclic dependencies are resolved when projecting them on conditions C1=1 and C1=2 (rectangles and rounded rectangles denote inputs and outputs, respectively). Incidentally, my PhD thesis was about a mathematical model for such conditional dependency graphs, which was later developed into an algebra of graphs. sprsh2 fetch "B1" = Just $ do c1 <- fetch "C1"
if c1 == 1 then fetch "B2"
sprsh2 fetch "B2" = Just $ do c1 <- fetch "C1"
if c1 == 1 then fetch "A1"
The big difference compared to sprsh1 is that the computation now takes place in a Monad, which allows us to extract the value of C1 and fetch different keys depending on whether or not C1 = 1.
λ> fromJust $ track sprsh2 fetchIO "B1"
As expected, the dependencies of cell B1 from sprsh2 are determined by the value of C1, which in this case is obtained by reading from the standard input via the fetchIO callback. Given a task description, a target key, and a store, a build system returns a new store in which the values of the target key and all its dependencies are up to date. What does “up to date” mean? The paper answers that in a formal way. Here Store k v is an abstract store datatype equipped with getValue and setValue functions. The busy build system defines the callback fetch so that, when given a target key, it brings the key up to date in the store, and returns its value. The function fetch runs in the standard Haskell State monad, initialised with the incoming store by execState. To bring a key k up to date, fetch asks the task description task how to compute k. If task returns Nothing the key is an input, so fetch simply reads the result from the store. Otherwise fetch runs the action act returned by the task to produce a resulting value v, records the new key/value mapping in the store, and returns v. Notice that fetch passes itself to task as an argument, so that the latter can use fetch to recursively find the values of k‘s dependencies. Given an acyclic task description, the busy build system terminates with a correct result, but it is not a minimal build system: it doesn’t keep track of keys it has already built, and will therefore busily recompute the same keys again and again if they have multiple dependants. See the paper for implementations of much more efficient build systems. We have already used a few cool Haskell types — Identity, Const, WriterT and State — to manipulate our Task abstraction. Let’s meet a few other members of the cool-types family: Proxy, ReaderT, MaybeT and EitherT. This works similarly to the dependencies function, but in this case we do not even need to record any additional information, thus we can replace Const with Proxy. One might wonder: if we do not need the fetch callback in case of input, can we rewrite our Task abstraction as follows? Yes, we can! This definition is isomorphic to Task. This isn’t immediately obvious, so below is a proof. I confess: it took me a while to find it. The toTask conversion is relatively straightforward, but fromTask is not: it uses a ReaderT monad transformer to supply the fetch callback as the computation environment, extracting the final value with runReaderT. The exceptional task transformer simply hides exceptions of the given fetch of type k → f (Either e v) by using the standard ExceptT monad transformer, passes the resulting fetch callback of type k → EitherT e f v to the original task, and propagates the exceptions by runExceptT. Using MaybeT, one can also implement a similar task transformer that turns a Task Monad k v into the its partial version Task Monad k (Maybe v). λ> computeND sprsh3 store "A1"
λ> computeND sprsh3 store "B1"
λ> computeND sprsh1 store "B1"
Notice that we can apply computeND to both non-deterministic (sprsh3) as well as deterministic (sprsh1) task descriptions. Here we simply compose two task descriptions, picking the first one that knows how to compute a given key. Together with the trivial task that returns Nothing for all keys, this gives rise to the Task monoid. We introduced the task abstraction to study build systems, but it seems to be linked to a few other topics, such as memoization, self-adjusting computation, lenses and profunctor optics, propagators and what not. Our implementations of functions like dependencies are heavily inspired by — or to be more accurate — stolen from the lens library. Alas, we have been unable to remove the Maybe used to encode whether a key is an input, without complicating other aspects of our definition. Here the keys n < 2 are input parameters, and one can obtain the usual Fibonacci sequence by picking 0 and 1 for n = 0 and n = 1, respectively. Any minimal build system will compute the sequence with memoization, i.e. without recomputing the same value twice. So here is a claim: given a Task, we can memoize, self-adjust, propagate and probably do any other conceivable computation on it simply by picking the right build system! This is convenient if tasks are aware of failures. For example, a task may be able to cope with missing files, e.g. if fetch “username.txt” returns FileNotFound, the task could use the literal string “User” as a default value. In this case it will depend on the fact that the file username.txt is missing, and will need to be rebuilt if the user later creates this file. In many cases this approach is isomorphic to choosing v = Either e v’. We are choosing f = Maybe and thanks to the polymorphism of Task, any task can be executed in this context without any changes. For example, sprsh1 fetch “B1” now returns Just (Just 30), but sprsh1 fetch “B2” fails with Just Nothing. This is convenient if tasks are not aware of failures, e.g. we can model Excel formulas as pure arithmetic functions, and introduce failures “for free” if/when needed by instantiating Task with an appropriate f. Also see the function exceptional defined above, which allows us to add arbitrary exceptions to a failure-free context f.
Are there any other types of failure that are not covered above? (*) Beware: as of writing, standard WriterT transformers have a space leak which may be an issue if a task has many dependencies. You might want to consider using a more efficient CPS-based WriterT transformer. If your original f doesn’t support failure you can replace it with Compose Maybe f.
Thanks for your comment, Sjoerd! We’ve been thinking along similar lines, and perhaps the Task abstraction can still be improved by finding a better way to express various failures. This is convenient when the task has a built-in notion of failures. For example, a build rule may be designed to cope with some missing files, e.g. if fetch “username.txt” returns FileNotFound, a build rule could use the literal string “User” as a default value. In this case it will depend on the fact that the file “username.txt” is missing, and will be rebuilt if the user later creates this file. In many cases the result is isomorphic to choosing v = Maybe v’. Now we are choosing f = Maybe. This is convenient when the task itself has no built-in notion of failures, e.g. we can model Excel formulas as pure arithmetic functions, and introduce failures “for free” if/when needed by instantiating Task with an appropriate f.
(3) Finally, the task itself might not want to encode failures into the type of values v, but instead demand that f has a built-in mechanism for expressing failures. This can be done by choosing an appropriate c, e.g ApplicativeZero, MonadZero, Alternative, MonadPlus, etc. Here the first Maybe is outside f, so a failure is known ‘statically’ by simply looking at the given key (similar to the above fetch example with Map.lookup). This will not work in cases when you need to perform some effects in order to determine if the lookup has failed, e.g. to check if the file is actually missing on disk. Here you want something like IO (Maybe v) instead, and I see no way of fitting this into the above type signature. is essentially the same as ours with respect to failures, but it doesn’t have a mechanism to (statically) indicate that a given key is an input. Are you suggesting to indicate this using the failure mechanism? While this works for some examples, I don’t think it’s sufficient in general: some of our build systems exploit the fact that it is possible to determine whether a key is an input statically, without performing an actual computation, i.e. they require the function isInput implemented above. After removing Maybe from the result, it becomes harder or impossible to implement isInput. I think I should add the above explanation of three ways of modelling failure into the blog post. I’ve added a section on failures to the blog post. > This definition is isomorphic to Task. This isn’t immediately obvious, so below is a proof. I confess: it took me a while to find it. And I’m sure the existentially quantified term needs to be treated differently, but no idea how. In any case I would be really interested if there was some way to reason algebraically either to determine that there must exist some isomorphism to Task2, or to derive the implementation. So I guess an alternative would have `(f v)` and `k` both be constrained to `Finite` but that’s probably not useful at all. Hello Brandon! Many thanks for sharing your observations — they are very interesting and useful. As soon as my versions of toTask and fromTask successfully compiled I happily switched to other things and never looked back. But it’s interesting to see if we can find a more principled approach to finding such transformations — mine was: think really really hard and try out monad transformers until it works 🙂 Surely we can do better. Also thanks a lot for the reference to `assemble` and `Finite`. This is something that might come in handy in my work on selective functors (https://blogs.ncl.ac.uk/andreymokhov/selective).